There many ways to promote blog on internet, one of them is promote blog on twitter. Twitter is a free social networking and microblogging service that enables its users to send and read messages known as tweets. You can do the following tips to automatically publish your blog on twitter. First Step: Create an account on twitter. If you have already an account on twitter, go to the second step. Second step: Create an account FeedBurner and publish your Blog Feed here. If you have an account here, go to third step. Third step: Login to your FeedBurner account. 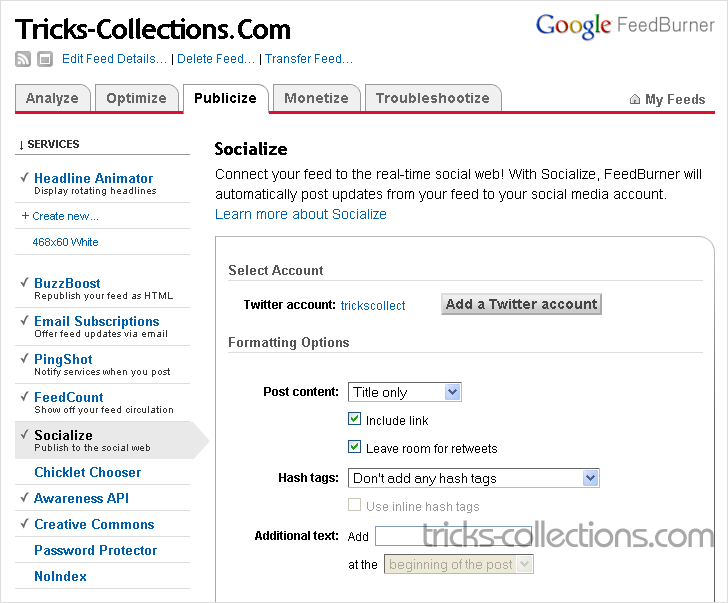 Go to publicize tab then Click socialize menu. Click add twitter account (it will automatic open twitter webpage). 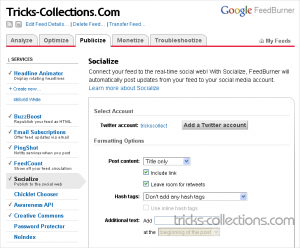 Click Allow button to allow access feedburner account. Related to "Automatic Publish Blog on Twitter"
Thanks for the step by step explanation. That took some time! What is your opinion on whether this process is frowned upon by Google in its determination of your blog placements in the search engine? @Daily Inquirer, I don’t know Google frown this process or not but this features found on feedburner and feedburner is owned by Google. Now I have disable auto publish to twitter on my feedburner because with this features I can not control the article that I publish. I love your post. This was very nice to read. I am curious why I didn’t find this blog before. Sharing is a virtue, and more readers need to read this post. I will try to spread the word. Many of my friends will love it.